For decades (yes, Google is coming up on two decades), Google's trademark minimalist, all-white homepage has been the most successful effort to "branding" its ubiquitous search product. The Google search homepage appears on TV shows, in movies, video games, books, magazines, and news articles all over the world. Google's web search is so well-known and so dominant that "Googling" something quickly supplanted the actual word "search," because what else would you use to look something up? Bing? Hah (I'm waiting for That Bing Person now). Dramatically changing that instantly-recognizable layout might, then, seem like borderline-heresy given the success it's brought. But that's exactly what Google is doing. Ignoring the complaints of people who relied on those personalized tools, Google continued to push more consumption-oriented content by introducing Feed. Content that, inevitably, displays ads served by Google. In a way, it's not surprising at all: Google has clearly been testing a content-forward layout on its own launcher (via the Now, then Feed, and now Discover pane), and the Google app has been Feed-focused since the end of 2016. Both interfaces were ostensibly extensions of the standard search product, and the deprecation of most personal content like emails, package tracking, traffic, personalized topics, and tickets out of the feed has made one thing extremely clear: Feed makes money. Think about it. Ignoring the complaints of people who relied on those personalized tools, Google continued to push more consumption-oriented content by introducing Feed. Content that, inevitably, displays ads served by Google. Algorithmically targeted content is a powerful force, something social networks have made abundantly clear to us in the last few years. And Google was probably aware of this well before we were. As I watch this trend unfold, I'm reminded of the words of Sundar Pichai at the I/O developer conference in 2012, when Google Now was first announced. I'm paraphrasing, but the gist is etched in my mind: Google's goal is to give you what you want before you know you want it. Targeted, suggested content is the latest - and arguably most direct - attempt to make good on this promise. 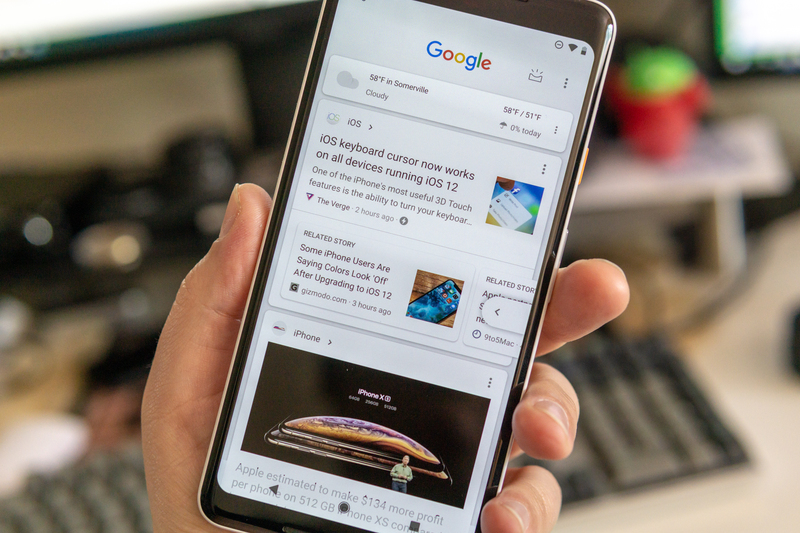 And with that content soon to be embedded on Google's mobile homepage, tens (maybe hundreds) of millions of users around the world will soon be getting what they "want" - whether they want it or not. This also marks a real shift in the question of how the average person is using Google, and what Google is for. In the early days of the internet, search was indispensable - the web was a maze of poorly-documented, unrelated sources often laid out in ways that made finding critical information extremely difficult. Google was the gentle hand guiding us in our shared search for authentic tools and sources, and Google became far, far better at this than its once-numerous rivals. Today, Google still serves that purpose, but the average person also has a far better understanding of where the things they need and want are on the web. Sure, we all still use search a lot, but I would argue we individually spend a far smaller portion of our time on the web today actively searching - because finding has become so much easier. When's the last time you went to the second page of a list of Google results? It happens, yes, but what about the third page? I personally can't remember the last time I bothered to go beyond page two, and that in itself is a rarity compared to the total number of searches I perform in a typical week. Paradoxically, the better Google has become, the better it has become at getting out of the way and just giving us what we want - meaning we spend less time looking at ads on a results page, and have learned how to better ignore them. Now, obviously search is still tremendously, almost unbelievably profitable for Google. Alphabet makes more money than it ever has from Google, and search is the driving force behind that profitability. But I can see a day - when a generation of children raised on Snapchat, Facebook, and voice-controlled computers become adults - that Google's seemingly indomitable search engine and ad platform could face challengers coming in at the periphery. Google's new mobile homepage - now with Discover. Google has invested heavily in voice assistants, machine learning, and in optimizing the mobile web to be minimally annoying while still presenting sufficient advertising to turn a healthy profit. These are the core pieces that are probably going to be necessary for Google going forward, at a time when computers increasingly are not things we ask questions to in search of specific answers, but which present possibilities and the opportunity to discover something we didn't even know was out there. I was decidedly part of what I will call the "query generation" - learning all the Google search modifiers, how to weed out irrelevant results, and sorting through my Gmail like a mail room ninja. And for the the majority of my life, Google has been that empty, white box - just awaiting my command to comb the unfathomable bigness of the internet for whatever I wanted. But increasingly, I find myself drawn more to that left pane of my homescreen, where Google is telling me what I might want to see. And it's often pretty good at guessing. Android Police's traffic statistics (and Google's own numbers) support this: we've seen a tremendous boost in Google-referred traffic since Feed and Feed-related products began rolling out widely in the last year. People are engaging with suggested content, and they're doing so frequently. It's a bigger change in the way we use the internet than I think we all realize right now, but it's clearly a shift that's underway. Google Feed, and products like it, are just the beginning of this larger, machine learning-powered revolution. Ten years from now, I have a feeling we'll all look back at Google's moves here as highly prescient, and for those of us in the 30-plus crowd, the internet will probably start to seem like a very weird, and very different place than it was when we grew up.